Independent Pilots Financial Services is part of the Benchmark Capital Group, backed by FTSE 100 company Schroders. Our investment committee often draws upon Schroders vast resources. This piece is written by one of their investment writers. In many cases they make an already tough decision to part with your money and invest even harder, leading some to not invest at all. Behavioural scientists have a name for this: loss aversion. They estimate that the psychological pain of losing is about twice as powerful as the pleasure of gaining, hence why some people shy from the risks involved with investing. Of course choosing to invest depends on your personal circumstances and if you are unsure as to the suitability of any investment speak to a financial adviser. 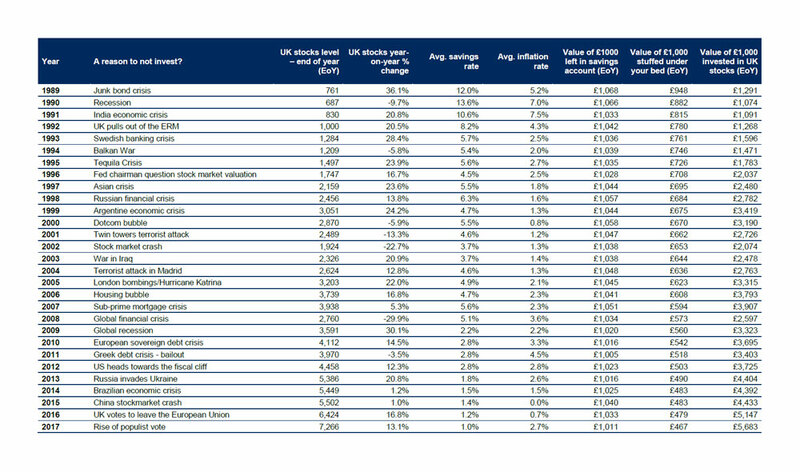 In 2001, the FTSE All-Share index fell by 13%. It was in the wake of the bursting of the dotcom bubble at the end of 1990s, when highly-rated technology stocks were sold off. But it also coincided with the devastating attacks on the World Trade Centre in New York in September. The period also saw a global economic slump, although the UK managed to avoid recession. 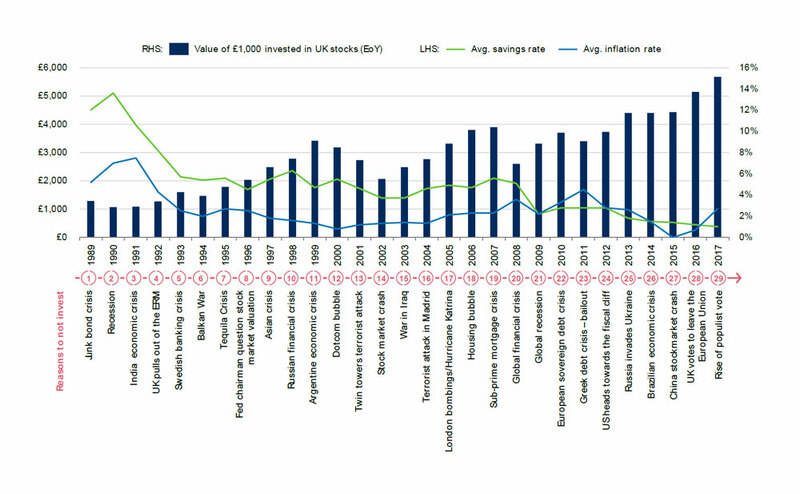 The FTSE All Share index was down 22% in the year to the end of 2002. 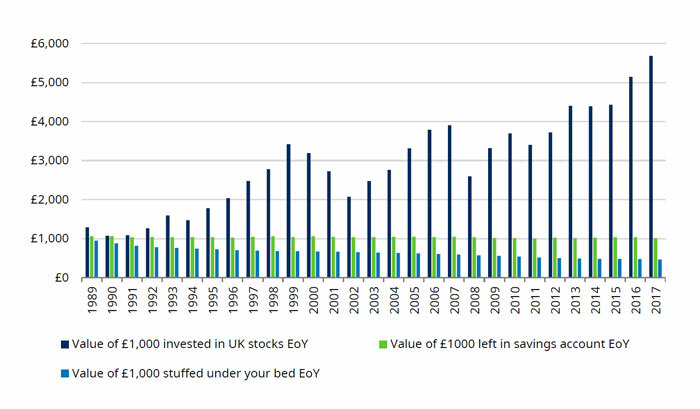 The table below illustrates how your investment returns could build up year by year between 1989 and 2017 and shows the damaging effect inflation can have on your wealth. It also shows global events that investors could have used as excuses not to invest in any of those given years. “This data shows that investors who had instead opted to stay in cash would have seen their savings destroyed by inflation during a period when the stock market rallied. Quite frankly, there’s many other periods of the last century which offer the same conclusion. Even the Second World War offer decent stock market returns in the US and UK. The opinions included above should not be relied upon and should not be construe as advice and/or a recommendation. Past performance cannot be relied upon as a guide to the future performance and the value of your money may fall when invested. Important Information: The views and opinions contained herein are those of the authors of this page and may not necessarily represent views expressed or reflected in other Schroders communications, strategies or funds. This material is intended to be for information purposes only and is not intended as promotional material in any respect. The material is not intended as an offer or solicitation for the purchase or sale of any financial instrument. The material is not intended to provide and should not be relied on for accounting, legal or tax advice, or investment recommendations. Reliance should not be placed on the views and information in this document when taking individual investment and/or strategic decisions. Past performance is not a guide to future performance and may not be repeated. The value of investments and the income from them may go down as well as up and investors may not get back the amounts originally invested. All investments involve risks including the risk of possible loss of principal. Information herein is believed to be reliable but Schroders does not warrant its completeness or accuracy. Reliance should not be placed on the views and information in this document when taking individual investment and/or strategic decisions. Some information quoted was obtained from external sources we consider to be reliable. No responsibility can be accepted for errors of fact obtained from third parties, and this data may change with market conditions. This does not exclude any duty or liability that Schroders has to its customers under any regulatory system. FTSE: FTSE International Limited (‘FTSE’) © FTSE 2016. ‘FTSE®’ is a trade mark of London Stock Exchange Plc and The Financial Times Limited and is used by FTSE International Limited under licence. All rights in the FTSE indices and / or FTSE ratings vest in FTSE and/or its licensors. Neither FTSE nor its licensors accept any liability for any errors or omissions in the FTSE indices and/or FTSE ratings or underlying data. No further distribution of FTSE Data is permitted without FTSE’s express written consent. Regions/sectors shown for illustrative purposes only and should not be viewed as a recommendation to buy/sell. To the extent that you are in North America, this content is issued by Schroder Investment Management North America Inc., an indirect wholly owned subsidiary of Schroders plc and SEC registered adviser providing asset management products and services to clients in the US and Canada. For all other users, this content is issued by Benchmark Capital, Sussex House, North Street, Horsham, RH12 1RQ. Registered No. 09404621 England. Authorised and regulated by the Financial Conduct Authority. This entry was posted in News on February 2, 2019 by Abigail. The 2018 Budget included proposals to make important changes to the capital gains tax (CGT) treatment of properties that have been used by the owner as a private residence for part (but not all) of the period of ownership, and let out for the rest of the period.